Winsor & Newton Professional watercolour range offers bright, vibrant colours and unrivalled performance. With 75 single pigment colours in the range, Winsor & Newton offer the widest range of modern and traditional pigments for superb colour mixing. The transparency of Professional Water Colour is due to the way the pigment is dispersed during manufacture. In thin washes, the colour is present but the reflective white of the paper can still be seen. The colours provide brilliance and clean mixing and the natural characteristics of pigments mean that some will be more transparent than others. 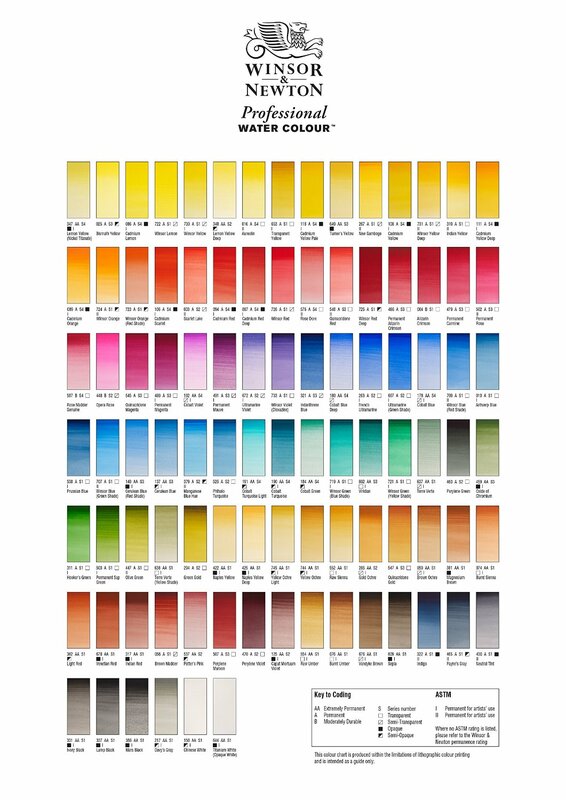 93 out of 96 colours in the Professional Water Colour range are classed as "permanent for artists' use”, rated AA or A for permanence to ensure that the colours used today will appear the same for generations to come.